These aphids have been detected in relatively large numbers in Sedgwick County, Kansas and reported by Mr. Zack Simon, Sedgwick County Extension Agent. Blister beetles are aggregating in many different fields throughout north central Kansas. These swarms are causing much concern. Blister beetles can be controlled, if needed, however they usually do not cause widespread defoliation field-wide. They normally aggregate in large numbers in localized areas for a week to 10 days. 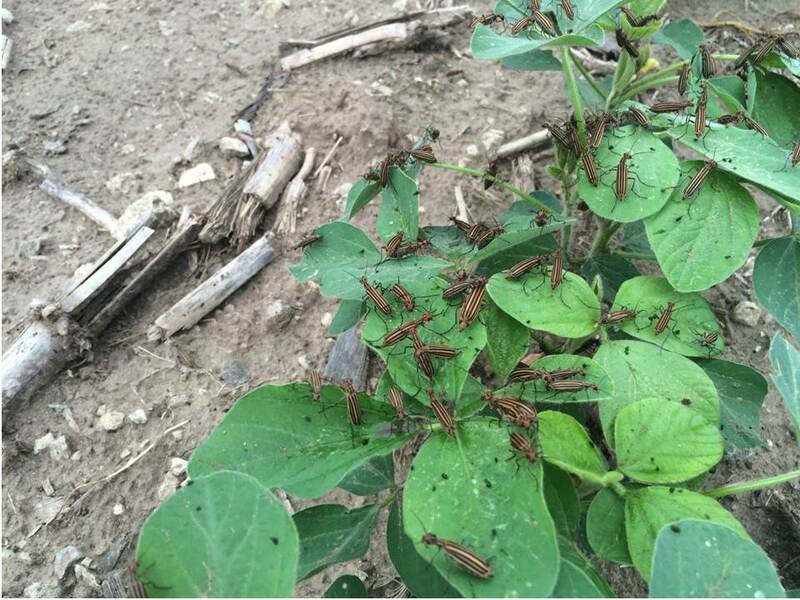 These swarms can occur in soybean fields (see photo), alfalfa fields, and/or on pigweeds adjacent to these fields (see photo). These swarms will soon disperse so the females can start ovipositing and thus will not cause as much concern in crop fields. 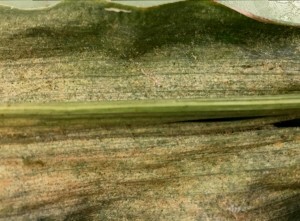 Corn was sampled in north central Kansas on 27 and 28 July. 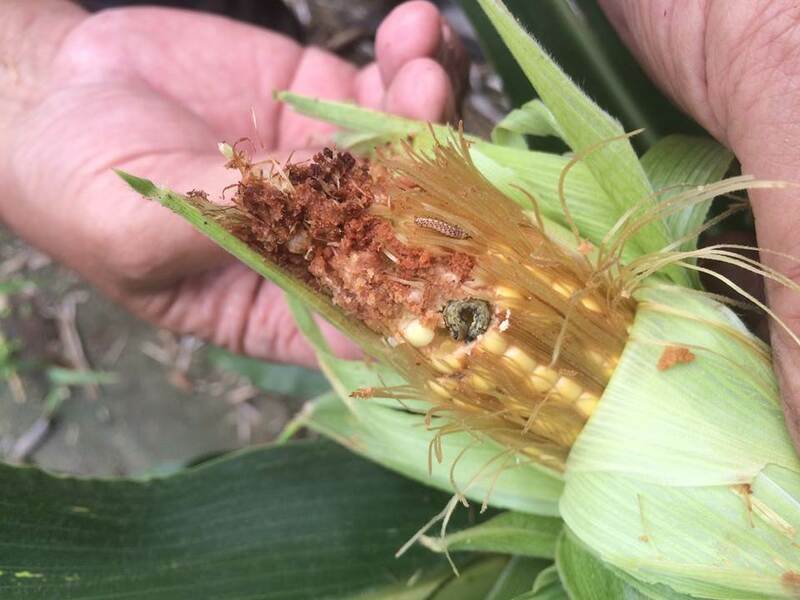 Corn earworms are infesting approximately 100% of the ears sampled, regardless of the developmental stage – from just pollinating to just entering the dent stage. 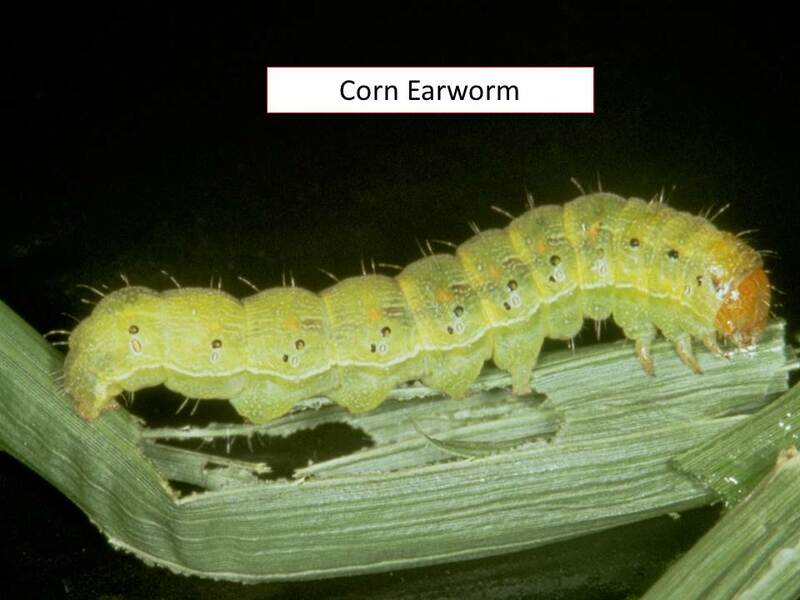 These earworms are also at different developmental stages which means they will be feeding on these ears for anywhere from 1-3 weeks, then start pupating in the soil. The adults will then move from these pupation sites to oviposit in sorghum and/or soybean fields, depending upon the growth stages of these crops. 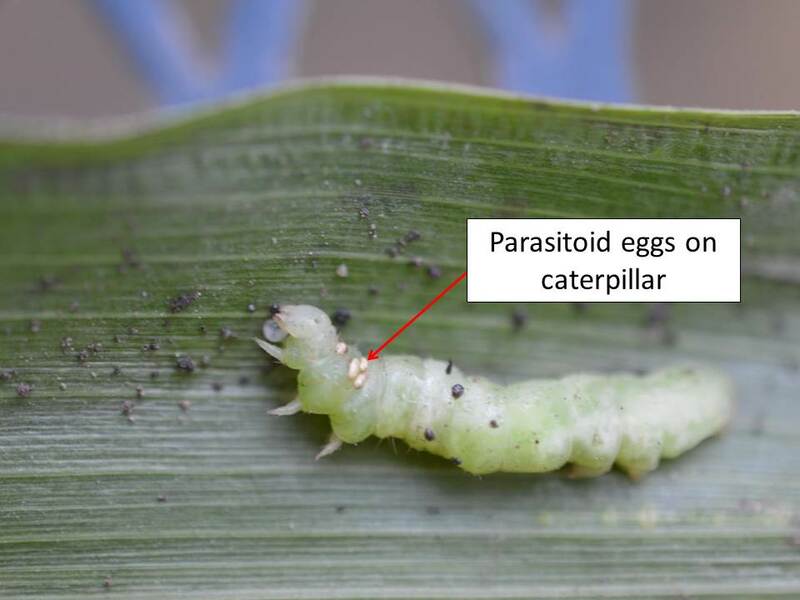 It is interesting to note that some larvae are being parasitized by beneficial insects, which should be considered when determining the need for an insecticide application. 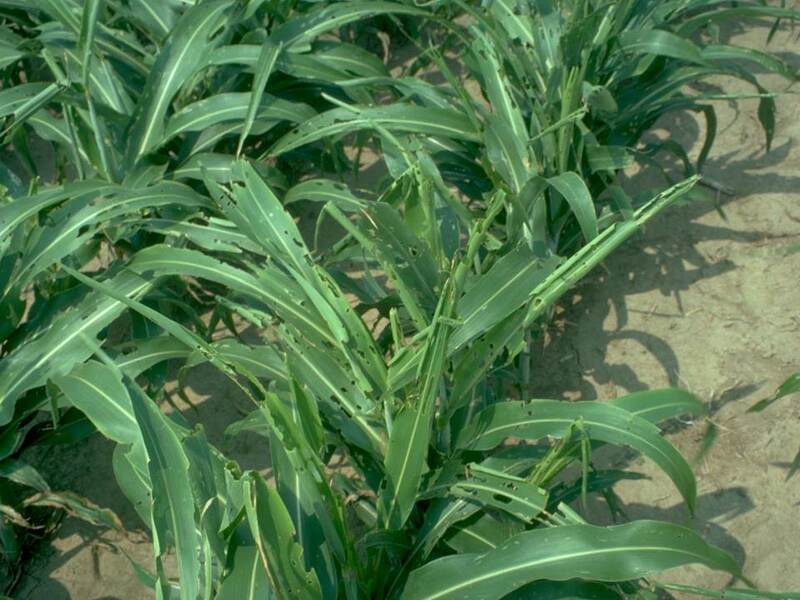 Much of the sorghum in north central and south central Kansas will soon be, or is already at, the whorl stage. 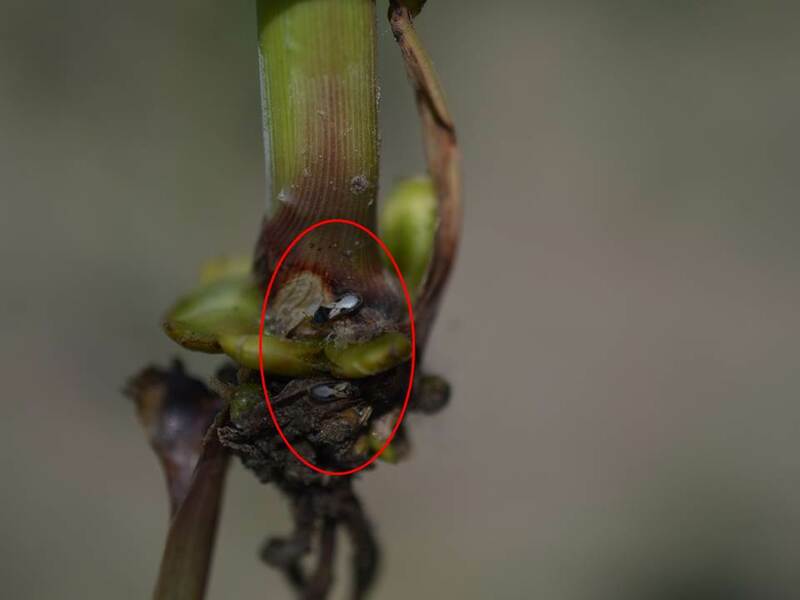 That usually causes much concern if there are larvae feeding in the whorls, resulting in many “ragged” looking plants (see pic). However, please remember that these worms cause highly visible defoliation but that does not translate into later problems with plant growth and development, or yield. 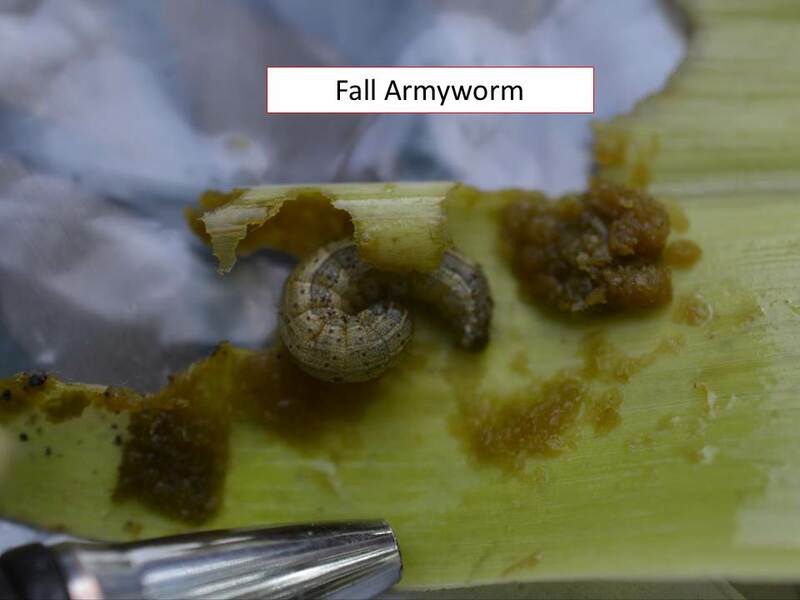 The larvae sampled this week in pre-whorl stage sorghum are mostly corn earworms (80%) with a few fall armyworms (20%) and were about half grown, so this feeding will continue for another 5-10 days. 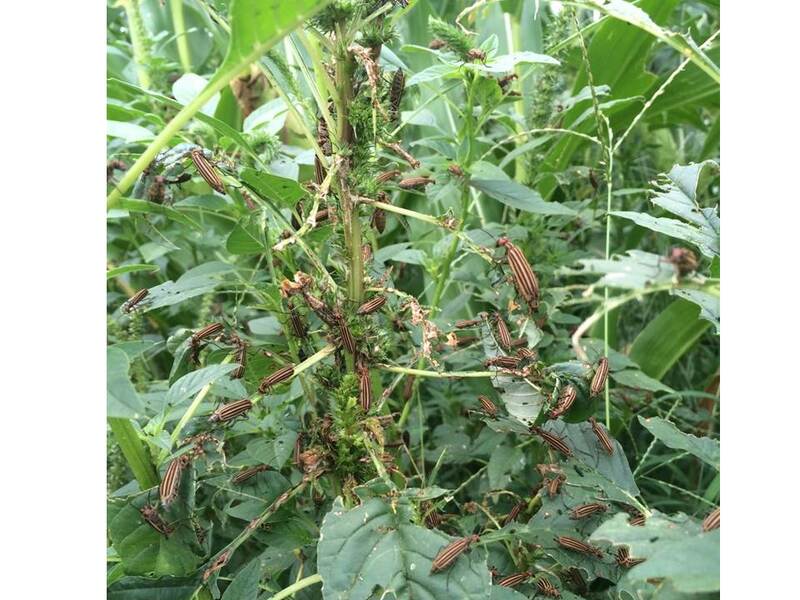 This is of interest because the adult corn earworm moths, when they begin ovipositing in approximately 2-3 weeks, will probably do so in soybeans where pod feeding by the larvae can have a direct effect on yield. The corn in western Kansas is in various stages of development, anywhere from late whorl to R3, due to the rains that delayed plantings in many areas. Much to the dismay of many farmers, the spider mites have risen to economically damaging numbers despite the rainfall. This rainfall and the large temperature fluctuations have contributed to some interesting shifts in the spider mite populations this year. Generally, we expect the banks grass mites weeks before any two-spotted mites are seen. However, it has been just the opposite in many places this year. 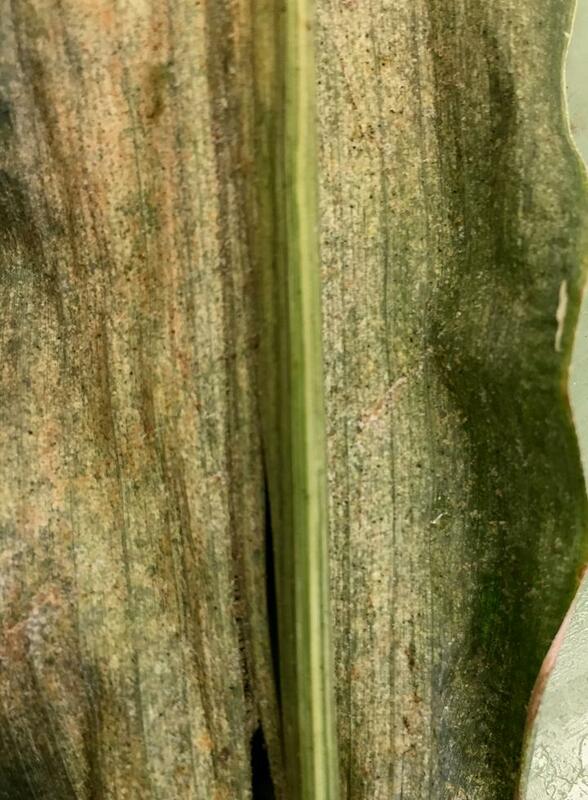 In early July, low populations of what was formally known as the carmine mite*, now two-spotted spider mite, started appearing in corn fields in the western parts of Kansas (see photo below). The two spotted started on the lowest leaves and have slowly progressed up towards the ear leaves. 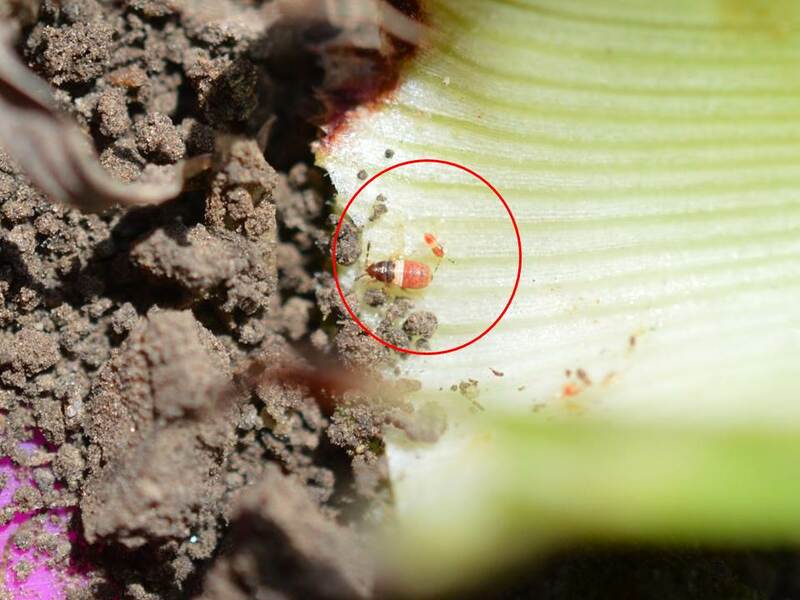 The populations of the red form of the two spotted mite show up periodically in row crops every couple of years in Kansas and this year they are especially abundant. The cause of these differences in occurrence of the two forms are currently not known. The red and white forms have been split into two different species and then later joined again into one species more than once over the last century. 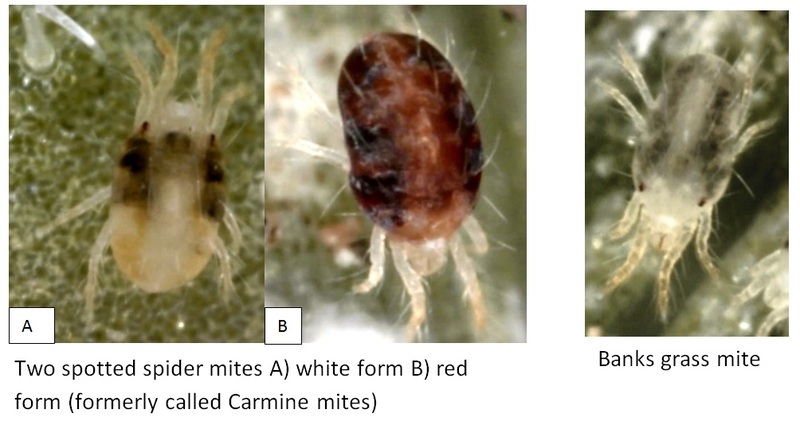 Some spider mite taxonomists even now debate their validity as a joined species. Fast forward to today and the banks grass mites have joined the “party” recently in Kansas fields. Interestingly, both the two-spot and the banks grass mite have been found sharing the same space on the leaves in many fields (see photo below). 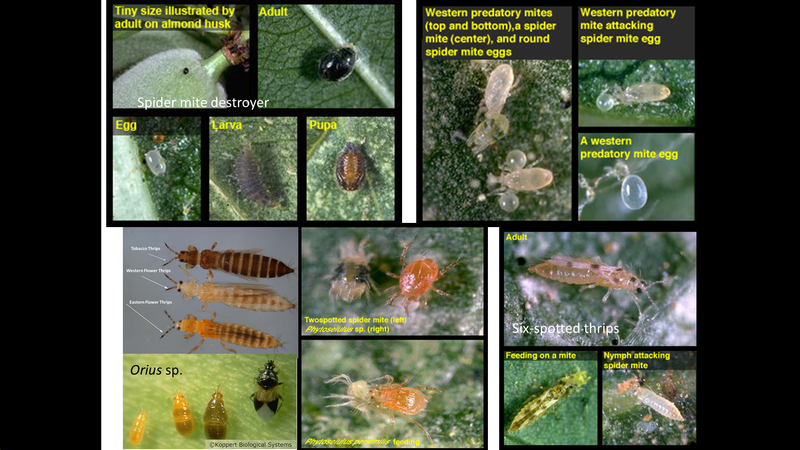 There are many predators that can help lower spider mite populations, however there are generally a few days to a week lag time between spider mite populations rise and the subsequent predator population rise. Keeping the predators happy and alive in crop fields mean more consistent spider mite control and less harsh insecticides needed later in the season. Most of the miticides that are applied before economic injury levels are reached rely on predators to “clean up” those mites not killed by the miticide. These include the “softer” miticides like Oberon, Onager, Portal, Zeal and Comite II. With these miticides, coverage is key, and 5 gal per acre for aerial applications, 10 gal per acre ground rig applications are recommended. When a quick “knock-down” is needed for higher populations that have already reached economically damaging levels, the more “harsh” insecticides may have to be used. These would include chlorpyrifos, dimethoate, bifenthrin or mixtures containing these ingredients. Although many of these will kill any predators present which could lead to later flares in mite populations. These “harsh” products do not kill eggs, so the residue of the insecticide must be present long enough to kill those later, newly hatched larval mites.